In a bid to attract more global oil majors, the Ministry of Petroleum and Natural Gas has proposed exemption from royalty payment and an income-tax holiday of up to 10 years for the next round of auction of oil and gas exploration blocks. In a draft note to the Cabinet Committee on Economic Affairs (CCEA), the ministry recommended shifting to a revenue-sharing model from the current production sharing contract (PSC) framework, which allows explorers to recover their costs from commercial discoveries before sharing profit with the government. An Oil Ministry official said it proposed to incentivise exploration by exempting royalty payment on offshore oil and gas production. Currently, operators pay a 10% royalty on output from shallow water blocks, while for deepwater areas, the rate is 5% for the first seven years and 10% thereafter. However, royalty for onshore blocks, which is payable to the state in which the areas are located, would continue. The ministry also proposed to bring back income-tax holiday, which was withdrawn for gas producers through the Finance Bill 2011, he said. It is proposed that operators be exempt from paying income tax for 10 years for production from ultra-deepwater blocks and seven years for all other areas. 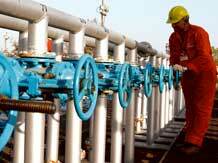 In addition, production of crude oil will be exempt from payment of oil cess of Rs 4,500 per tonne. The official said the revenue-sharing model was suggested based on the Rangarajan Committee recommendations. Under this model, the bidder quoting the highest amount of production it is willing to give to the government will get the block. The Comptroller and Auditor General of India criticised the PSC regime, saying it provides incentives to operators to inflate costs to lower the government's share of profit. The 10th round of oil and gas block auctions will be held under the new Uniform Licensing Policy (ULP), which would apply to all energy sources, including coal bed methane, shale gas and gas hydrates. Under ULP, revenue sharing will not be subject to cost recovery, monitoring will be simple and the government's share will accrue immediately on production. ULP will not differentiate between crude oil and natural gas producers on tax holidays, unlike in the pre-2011 period, when gas producers were not exempted from paying income-tax. The ministry profiled 46 blocks on Sunday - 17 onland, 15 shallow water and 14 deepsea - that will be offered for bidding after the CCEA approves the tax regime.